The pins are your board’s way to communicate with external devices connected to it. There are 19 pins for your disposal, numbered 0-16 and 19-20. Pins 17 and 18 are not available. 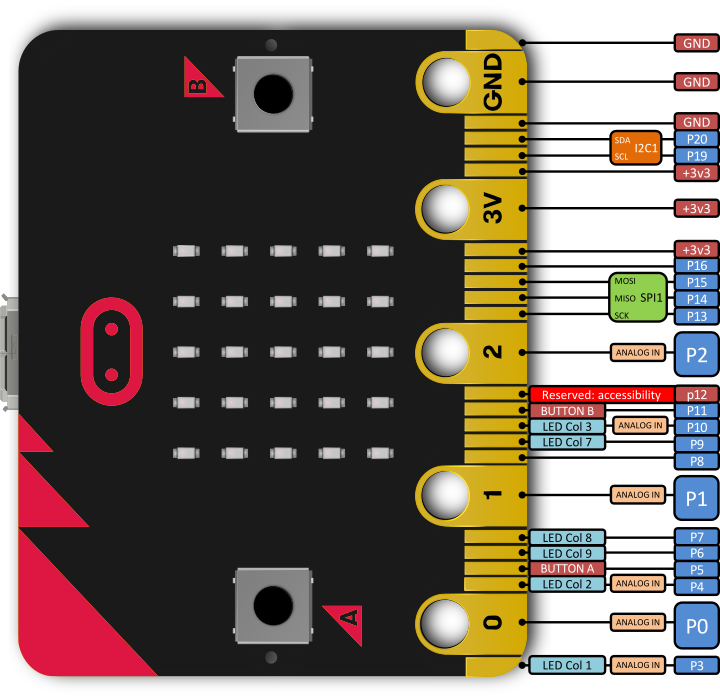 Those pins are available as attributes on the microbit module:microbit.pin0 - microbit.pin20. The above table summarizes the pins available, their types (see below) and what they are internally connected to. The pins of your board cannot output analog signal the way an audio amplifier can do it – by modulating the voltage on the pin. Those pins can only either enable the full 3.3V output, or pull it down to 0V. However, it is still possible to control the brightness of LEDs or speed of an electric motor, by switching that voltage on and off very fast, and controlling how long it is on and how long it is off. 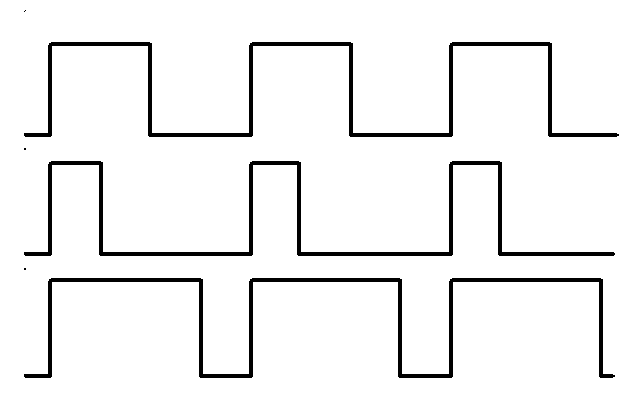 This technique is called Pulse-Width Modulation (PWM), and that’s what the write_analog method below does. Above you can see the diagrams of three different PWM signals. All of them have the same period (and thus frequency), but they have different duty cycles. The first one would be generated by write_analog(511), as it has exactly 50% duty – the power is on half of the time, and off half of the time. The result of that is that the total energy of this signal is the same, as if it was 1.65V instead of 3.3V. The second signal has 25% duty cycle, and could be generated with write_analog(255). It has similar effect as if 0.825V was being output on that pin. The third signal has 75% duty cycle, and can be generated with write_analog(767). It has three times as much energy, as the second signal, and is equivalent to outputting 2.475V on th pin. Note that this works well with devices such as motors, which have huge inertia by themselves, or LEDs, which blink too fast for the human eye to see the difference, but will not work so good with generating sound waves. This board can only generate square wave sounds on itself, which sound pretty much like the very old computer games – mostly because those games also only could do that. There are three kinds of pins, differing in what is available for them. They are represented by the classes listed below. Note that they form a hierarchy, so that each class has all the functionality of the previous class, and adds its own to that. Those classes are not actually available for the user, you can’t create new instances of them. You can only use the instances already provided, representing the physical pins on your board. Return 1 if the pin is high, and 0 if it’s low. Set the pin to high if value is 1, or to low, if it is 0. Read the voltage applied to the pin, and return it as an integer between 0 (meaning 0V) and 1023 (meaning 3.3V). Output a PWM signal on the pin, with the duty cycle proportional to the provided value. The value may be either an integer or a floating point number between 0 (0% duty cycle) and 1023 (100% duty). Set the period of the PWM signal being output to period in milliseconds. The minimum valid value is 1ms. Set the period of the PWM signal being output to period in microseconds. The minimum valid value is 256µs. Return True if the pin is being touched with a finger, otherwise return False. This test is done by measuring how much resistance there is between the pin and ground. A low resistance gives a reading of True. To get a reliable reading using a finger you may need to touch the ground pin with another part of your body, for example your other hand. The pull mode for a pin is automatically configured when the pin changes to an input mode. Input modes are when you call read_analog / read_digital / is_touched. The default pull mode for these is, respectively, NO_PULL, PULL_DOWN, PULL_UP. Calling set_pull will configure the pin to be in read_digital mode with the given pull mode. The micro:bit has external weak (10M) pull-ups fitted on pins 0, 1 and 2 only, in order for the touch sensing to work. There are also external (10k) pull-ups fitted on pins 5 and 11, in order for buttons A and B to work. GPIO pins are also used for the display. 6 of these are routed to the edge connector at 3, 4, 6, 7, 9. and 10. If you want to use these pins for another purpose, you may need to turn the display off. See the edge connector data sheet.